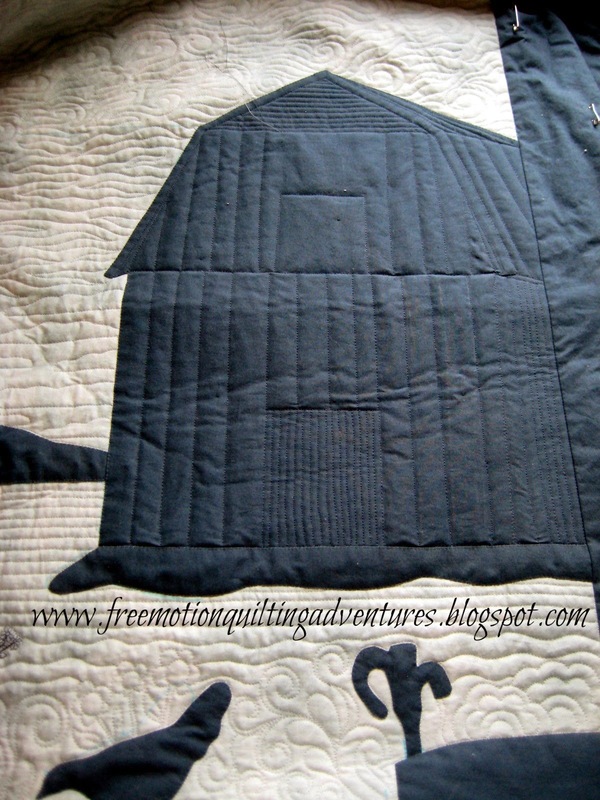 Amy's Free Motion Quilting Adventures: Free Motion Quilting: Barn! And finishing up my McTavishing sampler and getting ready for our last McTavishing Monday post coming up this Monday. What will the design for the Free Motion Monday link party be? I haven't quite decided. You still have time to chime in with a design idea in the comments. Speaking of comments: I've traded computers with my hubby so I no longer need to share a computer with the kids. But in the process, I'm pretty sure I have lost some recent emails. So if I was supposed to get back to you, I'm sorry. Also, I might not reply to as many comments while I'm getting everything set up. We had to move a bunch of files and programs around across different operating systems. I was doing a video last week of my McTavishing, when my Janome 6600 began making chewing sounds in the bobbin case. After checking the bobbin, I found that the thread had begun coming unwound from the other end and both threads were getting pulled into the stitches being formed. This caused the bobbin to stop turning. A good bobbin gone bad. I have found that a nearly empty bobbin can give you problems, so if you are at a stopping point and you see you're nearly out of thread, go ahead and start with a full bobbin. Good morning Amy...I was wondering what this quilt was about when I watched you quilting earlier on the white fabric...very nice. I really like how you quilted the barn. I hope you will keep showing lots of quilting though. I enjoyed the McTavishing. Never fear, there will be lots of quilting here! Ahem, sorry. Can you tell I spend a lot of time with Dr. Suess? Thanks so much for commenting. I have had the bobbin do that too! My Janome 7700 needs a check up as it is making weird noises. So, I am still working on the 1961 Pfaff from grandma. We think the thingy grabbing the thread in the Janome is bust or needs tweaking. We'll see! Would that thingy be the hook? One thing I have learned while working at the Janome dealer is that the slightest little varience can cause some real trouble, but that they usually can be fixed pretty easily. I've noticed that problem with the bobbin but never paid it much attention. In future when I take a break if I notice the bobbin is low on thread I will replace it with a fresh bobbin full of thread! heehee - I use that sound as an indication that my bobbin is about to run out. It's amazing how in tune you can become to the sound of your machine. I've not had it cause me any problems, but I can hear the difference! You are so right! I've noticed a sound change right before the bobbin runs out too. Usually, I think, "Hmmm, why did the sound change? Better check the bobbin." Your McTavishing is gorgeous I love the long swirls and the movement it creates. I'm still practicing and not seeing great improvement but keep trying. In watching your last video I realize I'm not making enough of a swirl line, it has been to straight and after watching your last one it's starting to look like I want it to. Thanks so much. Thank you for saying so! Keep practicing, you’ll get better every time!